Unfortunately, there are no known photographs of Francisco Solano. We do, however, know certain things about his life. He was baptized in the church of Nuestra Señora de Urrajás in Paraíso in the province of Cartago in Costa Rica on January 29, 1817, the son of Felipe de Jesús Solano Molla and Juana Josefa Alvarado Solano. Francisco Solano made a crucial connection in Costa Rica when he became acquainted with the family of Antonio Casanova. How and when, and under what circumstances, he made that acquaintance is not known; but what is known is that he traveled to California sometime between 1848 and 1850 with the Casanova family, which included patriarch Antonio Casanova, his wife, María Trinidad Serrano Puentes, and their three daughters: María Agustina, ﻿María Rosa﻿ de las Mercedes, and María Teodora. A fourth daughter, María de los Ángeles, was baptized in Costa Rica in 1847 but did not travel with her family to California. She presumably died in Costa Rica. 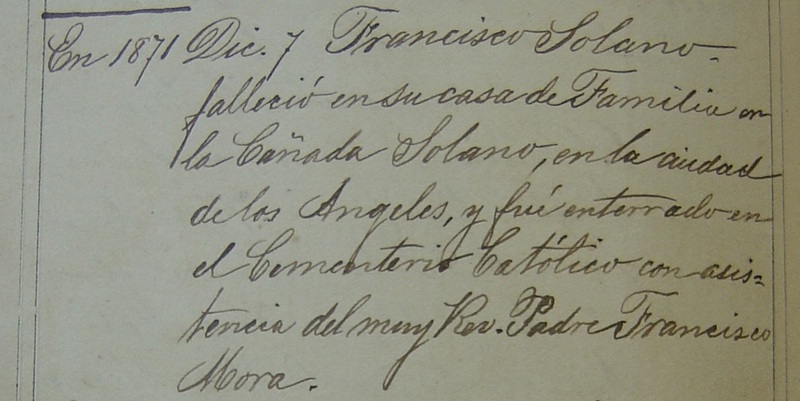 On May 27,1854, 37-year-old Francisco Solano was married in Los Angeles to 13-year-old Rosa Casanova by a juez de paz— a Justice of the Peace named William G. Dryden (to whom, the author is related by marriage). Thirteen months later, in 1855, Francisco and Rosa's first child, Josefina, was born. Then, on May 22, 1857, three weeks after their second child, Alfredo, was born, Francisco and Rosa were married again, this time in a Catholic ceremony by a priest in the Plaza Church. The other children of Francisco Solano and Rosa Casanova are Alejandro (1859), María Agustina (one of the author's great-grandmothers, named for her mother's sister, 1861), Manuel (1863), and Alonzo Francisco (1866). The following image, as well as the others in this biography, is from a page in a bible that Francisco's son, Alfredo, purchased as a gift to his elder sister Josefina. Alfred notes the purchase of two bibles — gifts for his two sisters — in his diary. Josefina's bible is still in the possession of the family of one of her descendants; the other, unfortunately, was destroyed in a house fire in 1995. 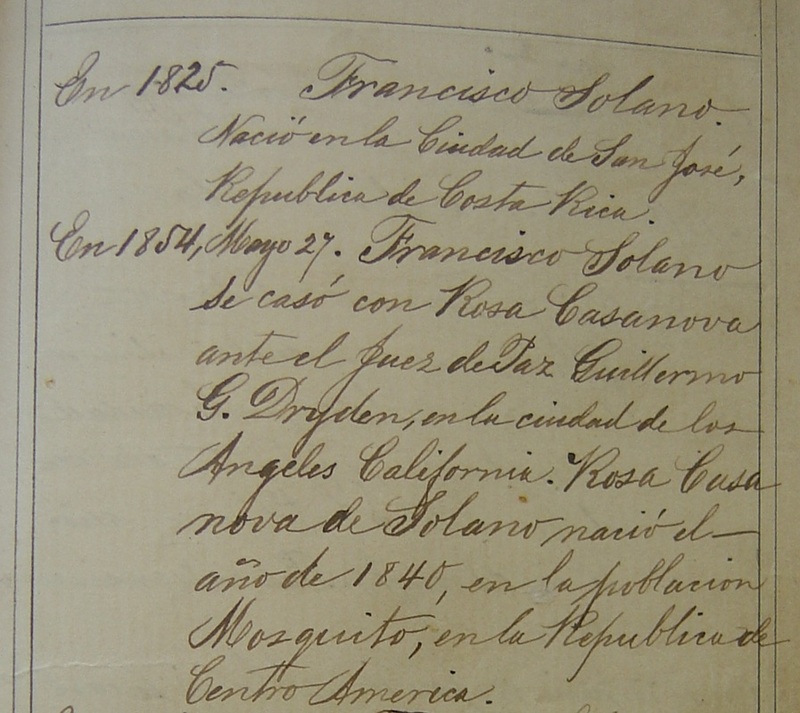 Francisco became a naturalized American citizen in Los Angeles in 1856. Francisco was a butcher by trade, and he maintained a meat-packing business and soap factory in Sonoratown, the largely-Hispanic community just north of the Plaza. He also kept a corral there. A truly fateful decision was made in 1866, when Francisco purchased 87 acres of land in the Stone Quarry Hills from the City. He moved his family, by then numbering his wife, Rosa Casanova, and their six children, up to the coolness of a then-unnamed ravine. He built an adobe for his family beside a small stream that flowed from a spring farther up the ravine. That unnamed ravine became known as Cañada de Solano or Solano Cañon, later Solano Canyon, and from that humble beginning sprang Solano Canyon, the community. Francisco Solano died December 7, 1871 in his adobe on the stream in Solano Cañon and was buried in the original Calvary Cemetery, just a stone's throw from his adobe.